On the corner of Prinsesse Charlottes Gade and Sjællandsgade stands a strange creature, frozen in eternal stillness. It could have originated from outer space, but has in fact emerged from artist Hans Henrik Øhlers‘ imagination. In reality it’s a handsome mix between a sculpture and a jungle gym and forms part of the Guldberg Byplads: a modern urban town square and playground. At night something magical happens. 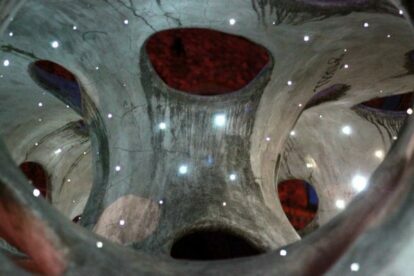 Hundreds of built-in fibre optics sprinkled all over the inside of the sculpture, like little twinkling stars, emphasize the otherworldliness of White Tube. You should go see it. Really. It’s beautiful. White Tube, as the sculpture is aptly named, definitely appeals to grownups as well as children. So take five minutes to get in touch with your inner child and climb into the belly of the creature! Doing so will probably leave you craving for more fun, and luckily you don’t have to look too far: a little further down the street, you will find a 20 meter high and very steep tube slide. The slide itself is shaped as a spiral, and I will be honest with you: I have never made it further than to stare down the pipe, and then turned around crestfallen and walked back down the stairs. I hope that you’re braver than me! Note that the slide is not accessible on weekends and evenings.